Earth Hour is a global movement for greater action on climate change. It started as a symbolic lights out event in Sydney in 2007 and has since grown worldwide. Each year lights are switched off from 8:30 to 9:30pm. This year Earth Hour falls on 24th March and here are 3 ways to take part. 1. Sign up to take part at the Earth Hour website and switch off your lights for one hour. 2. Grow some plants. I'm a beginner gardener and have three small wall planters filled with daisies, spider plants and pansies. 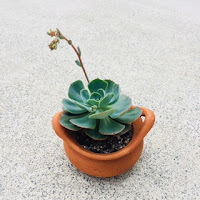 I love succulents and am so proud of my echeveria! I find gardening, even weeding very therapeutic. Gardening gives us a deeper connection with our surroundings. 3. Reduce plastic waste. Plastic is so harmful to the environment. I've spoken before about the harm plastic causes to our oceans but the main problem with plastic is that it never goes away. Exposure to toxic chemicals leached out of plastic are linked to cancers, birth defects, impaired immunity, endocrine disruption and other ailments. Little changes like using reusable shopping bags and refusing straws can make a big impact.